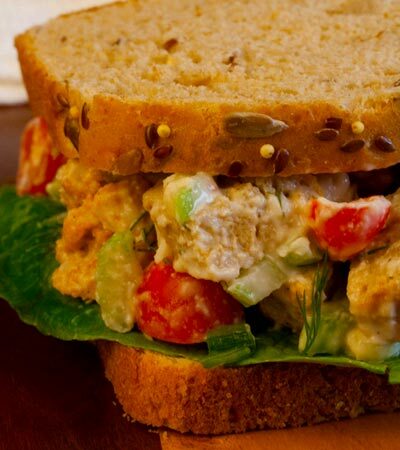 Chunks of bursting-with-flavor "chicken" seitan covered in creamy, low-fat dressing with dill. Mixed together with crunchy celery, spring onions and plump cherry tomatoes. 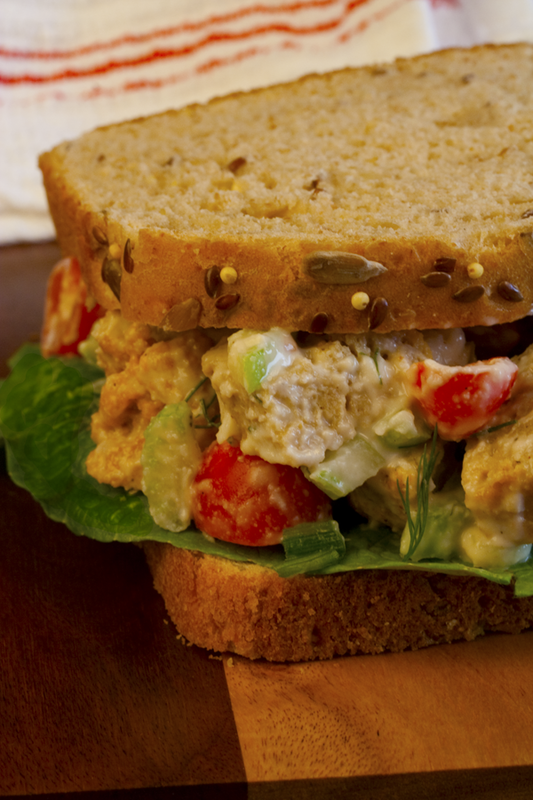 This is the ultimate vegan "chicken" salad. Makes a perfect light lunch with only 4.25 grams of fat. The flavor combinations make it perfect in-between homemade pumpernickel bread or on a bed of your favorite greens. Want to know what others thought about this recipe? Would you like to comment on this recipe? Go to the Vegan "Chicken" Salad blog entry. First prepare the "chicken" seitan. Go here for the recipe . For the dressing: place almonds, tofu, vinegar, salt, sugar, almond milk, onion and garlic powder and corn starch into a immersion or hand blender cup and blend with the immersion blender until smooth and creamy. Last put the black pepper and dill in and stir with a spoon. Place into a small sauce pan, on medium heat, stirring constantly, cook until it just starts to thicken. Don't overheat it or it will become too thick. In a large mixing bowl place tomatoes, celery and green onions. Chop the seitan loaf into 1/2 inch cubes and place that into the mixing bowl, along with the dressing. Stir together and it's ready to serve in-between bread as a sandwich or as a salad on your favorite greens.